The Z-fold design leads to a noticeable gap between panels at the points were the screen bends. However, the folding is aligned such that the overall form factor of the folded phone looks uniform. Google doesn’t mention ‘phone’ in its patent filing. Instead, it’s using “modern computing devices,” which means the technology could be used in phones, tablets, or even laptops. 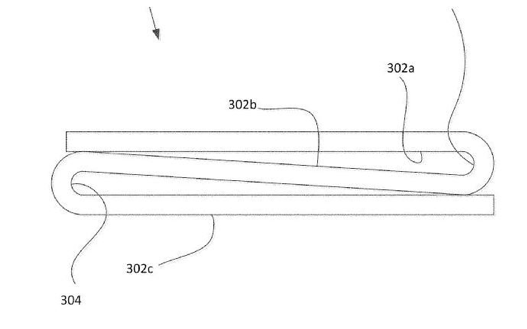 The patent application suggests that Google is flirting with the idea of foldable phones, but there’s that’s not a guarantee that they will produce a Z-fold design in the near future. Graphic designer Antonio De Rosadeveloped a concept that imagines an iPhone X-like design that can fold out to become what is essentially two side-by-side iPhones. In this concept, the foldable comes from behind and to the left, but also allows you to fold it completely shut. ​The display in this concept measures 6.6-inches when folded back and 8.3-inches when completely unfolded. In both formats, the display is “Super Retina” with 514 pixels-per-inch. This imagination also depicts how iOS might adapt to a foldable iPhone. The Home screen adds a handful of widgets along the right of the display when folded out. This would give quick access to things Music, Weather, Siri, and more. Apple has several patents that relate to foldable smartphones. Last month, a patent application from Apple detailed how a manufacturer could prevent damage when the screen is repeatedly folded and unfolded. The concept is pretty, but it doesn’t deal with the problem of having to open the phone for all actions, a problem that Samsung solved by adding a 2nddisplay on the outside.